The experience was incredible... but I´d have signed Meg and I up for an extra porter right off the bat had I realized how challenging carrying our own bags would turn out to be. Luckily we were able to get one after the first day (which wasn´t that bad, but was a climb at the end) so that we didn´t have to carry our bags the second and most challenging day (over the 4200m first and 3900m second pass). I carried Meg´s bag (minus the sleeping bag and a couple of other things) the third day. We were part of a group of six, including three Americans (Matt, Amy and Maggie) and a Brit on his final leg of a 10month adventure around the world (Steve). Our guide "Olly" was great, showing us the ropes and sights along the way. 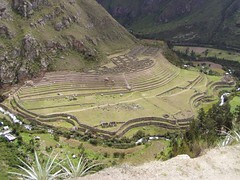 We saw a number of Inca ruins, of course culminating in Machu Picchu. The scenery itself was well worth the trip however, beautiful snow capped mountains, changes in plant life based on elevation and endless beautiful terrain. Just simply breathtaking (and quite literally when you´re climbing the last few metres towards the 4200m first pass!). Meg and I each had our strong and weak points, and were able to pull each other along. She was great at setting a pace going uphill, and there were many times where I was just watching her boots climb rough hewn rock stairs, following so as not to be left behind. I had worried initially about the downhill sections as they are largely high rock steps, but my knee pain didn´t manifest really and I had no problems. 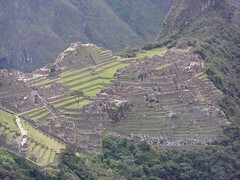 All in all, it was a great experience, and Machu Picchu topped off the whole thing. Talk about an amazing place. Set up so high on a mountain, such amazing stonework, so many buildings. I´ll post pictures when I get back to La Paz next week. All in all, a very worthwhile experience. Meg and I are now in Ica, Peru and will spend the next few days exploring the area (Nazca Lines, Paracas National Reserve, some local wineries, etc.) before heading to Lima for a night or two and then back on to La Paz. Submitted by Jenn (not verified) on Thu, 2007-05-03 21:34. Sounds like an awesome adventure! I can't wait to see the pictures! So glad you are having a great time! Oh... Dave... Mom wants to know if you are home for Jake's christening? Something about you not RSVPing? Submitted by kevin@haggaret.com on Thu, 2007-05-03 22:12. Well done Dave (and Meg of course)! Some day I'll get down there and do that same hike but for now I guess I'll have to just enjoy your story and the pictures you took. Submitted by Kim (not verified) on Fri, 2007-05-04 17:50. Just catching up on both of your blog entries from the past couple of weeks. 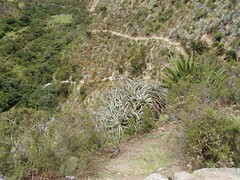 The Inca trail sounds incredible. Definitely not for the faint-hearted, but I'm not surprised the two of you rose to the challenge. I'm sure your photos are amazing. I hope the rest of your holiday is just as fun.